Bolsters Mills – Clayton C. Verrill Sr., 58, died Friday at his home. He was born Sept. 6, 1923, in Gorham, the son of Nathaniel and Emma Thompson Verrill. He was educated in Gorham schools and worked at S.D. Warren Paper Mill for a number of years. He also worked in the area woolen mills. He was a member of the Sons of Union Veterans and the Spurs Corner Congregational Church. 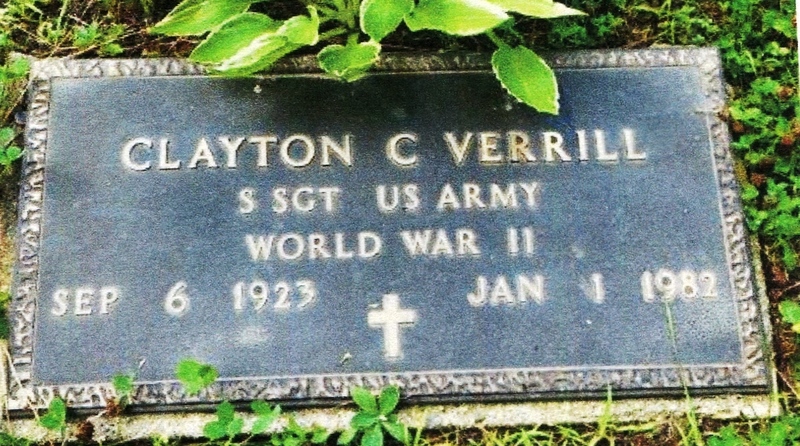 He served in the World War II with the U.S. Army in the European theater. He lived in Bolsters Mills for seven years, coming from Winslow. He married M. Estelle Smith in 1974, who survives. He is also survived by one son, Clayton C. Verrill, Jr., of Fairfield; three daughters, Brenda Butler of Clinton, Debora Strout of Benton, and Nancy Belyea of Augusta; three step-sons, Calvin L. Smith, jr. and Donald E. Smith, both of Norway, and Wesley N. Smith of Oxford; one step-daughter, Hazel L. Hill of Otisfield; 30 grandchildren; and seven great-grandchildren. Surviving Mr. Verrill are also two brothers, Harold and Paul Verrill, both of Gorham; three sisters, Lottie Prophet of Long Beach, Calif., Alice Libby of Boynton Beach Fla., and Dorothy Snow of Gorham.